Bodyguard R6X Recumbent Exercise Bike is one of the superb recumbent bike and best bike from the last 4 years. It has amazing space saving design, comfort and adjustability which makes R6X a must buy bike to provide your goals a breeze. Digital Contact Heart Rate-Faster and more accurate contact heart rate readouts shaped in a natural hand resting position. Target Watts Programming - Known as the “Anti-Cheat” program. Guarantee your results without the need of a chest strap. K2 Electromagnetic Resistance System - Silent, powerful, precise, durable and maintenance-free resistance. 6.5” Pedal Spacing - Increases comfort and reduces the risk of injury by promoting the correct alignment of the hips, knees and ankles. Storage Pocket - Keep your favorite magazines or newspapers in easy reach thanks to the handy storage pocket. Reclinable Seat Back -Find the perfect riding position to suit your body shape and adjust to target different leg muscles during exercise. *Note: Most of the sites, stores or shopping portals listed above sell Bodyguard R6X Recumbent Exercise Bike with discounts and other exciting offers. There is a possibility that the some of above websites are not selling Bodyguard R6X Recumbent Exercise Bike now. Toughtrain.com is not liable for such cases or instances. 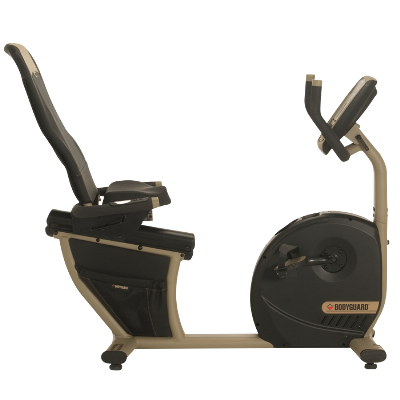 Also we do not recommend any seller for Bodyguard R6X Recumbent Exercise Bike and a buyer should buy from where he/she gets best deal with quality of products, service and on time delivery (shipment).